Chicagos Romantic Rebel delivers a brand of female fronted hard rock with unparalleled, explosive energy that has been taking the music scene by storm. 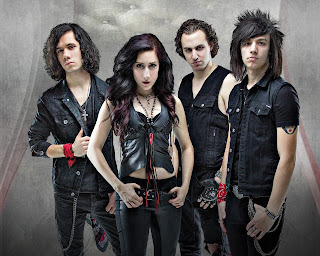 Formed in 2012 by siblings KT Paige (vocals) and Alex Vincent (guitar), the band recruited Zach Smith (bass) and Ty Del Rose (drums) to form what would become Romantic Rebel. Soon becoming a promotion machine, the group immediately started booking shows and distributing music to start gaining fans across the Midwest. Their rapidly growing fan base demanded more music from the group so the band entered the studio in late 2013 with renowned producer Ulrich Wild to record their debut album in Los Angeles, CA. The album was completed and named Revolver magazines Album of the Week, only days after its release. The band expanded its focus and started touring on a national level, supporting acts such as All That Remains, Sevendust, Asking Alexandria, Avatar, Crobot, Nonpoint, Otherwise and Like A Storm to name a few and started playing festivals like Rock Fest in Cadott Wisconsin. After playing numerous shows with FM Entertainment, Romantic Rebel signed with FM Music Management and TKO Booking and has completed runs with bands such as Buckcherry, RED, Texas Hippie Coalition, Tantric, Seasons After and Kobra and the Lotus. that climbed the UTR charts and played more festivals like the midwest staple WIIL Rock Fest in Franksville Wisconsin and mega rock powerhouse Louder Than Life in Kentucky. The band is currently in the studio with Grammy nominated producer, Johnny K (Disturbed, Pop Evil, Sevendust, 3 Doors Down) where work has begun on their sophomore album. 2016 looks to be a break out year for the band as they kicked it off in Las Vegas at the RadioContraband Rock Radio Awards with Killswitch Engage and impacting radio with their single "Too Far" produced and co-written by Johnny K. Tomorrow is here today and the band is poised to make its mark in the rock and music world.